President Donald Trump’s advisers are growing increasingly impatient with the „frustratingly slow“ progress with North Korea regarding denuclearization. Trump’s advisers reportedly don’t feel North Korean leader Kim Jong Un is serious about denuclearizing. Recent intelligence suggests the rogue state has privately continued its nuclear activities, despite the president’s assurances of progress. President Donald Trump’s advisers are growing increasingly impatient with the „frustratingly slow“ progress with North Korea regarding denuclearization, according to The New Yorker, which spoke with half a dozen former US government officials and allied diplomats who’ve been briefed by Trump officials on the subject. Trump administration officials are particularly concerned, according to the report, with Trump’s „very public embrace“ of North Korean leader Kim Jong Un, widely considered to be among the most repressive rulers in the world. 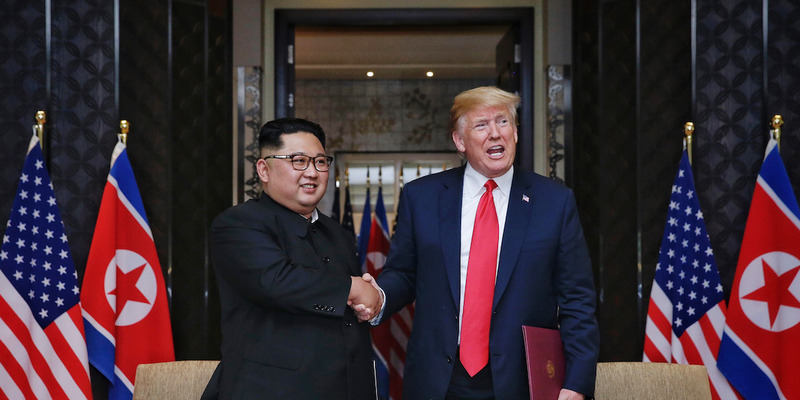 Trump and Kim met in Singapore in June, where North Korea ultimately pledged to work toward the denuclearization of the Korean Peninsula. But recent intelligence suggests the rogue state has privately continued its nuclear activities, despite Trump’s assurances of progress. „Their view is that North Korea is not serious about denuclearizing. The president, however, thinks history began when he became president,“ the official added. Jung Pak, the former top analyst on Kim at the CIA who left the agency last summer, told The New Yorker the North Korean leader is actively trying to divide Trump from his team. Recent statements from the North Korean government, for example, have alleged the president’s advisers are trying to „thwart“ his wishes when it comes to North Korea. „Kim watches us as much as we watch him and, unfortunately for us, this presidency is wide open,“ Pak said.